Hearts is a classic game for four players. Unlike most card games, Hearts works on golf rules—the player with the lowest amount of points is the winner. Winning is generally done by avoidance of certain cards that score points—namely, the hearts, after which the game is named, and also the ultimate old maid, the Queen of Spades. Hearts received a boost in popularity in the 1990s because Microsoft included a computerized version of it in its Windows operating system. The object of the game is to have the lowest score at the end of the game by avoiding the thirteen Hearts and the Q♠. Or, collect absolutely everything and watch your opponents suffer. You will need scorekeeping equipment (pencil and paper, or one of several smartphone/tablet apps that do all the math for you) and a standard 52-card deck of cards. 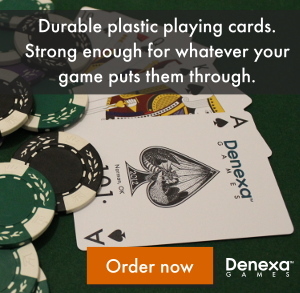 Use Denexa 100% Plastic Playing Cards for the full effect of the Q♠’s wrath—her role in Hearts is why her artwork on the Denexa deck depicts her with a uniquely…unpleasant expression. Shuffle and deal out the entire deck. 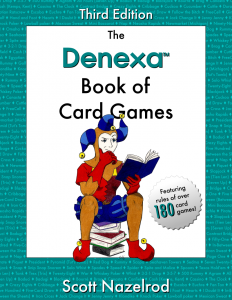 Each player should end up with thirteen cards. At the beginning of the first hand, each player selects three cards and pass them to the left; they will receive three replacement cards from the right. On the second hand, cards will be passed to the right; on the third, straight across. No passing occurs on the fourth hand. The fifth hand restarts the cycle, passing to the left, and so on. After passing has occurred, the player holding the 2♣ leads it. The next player to their left responds by playing a club, if they are able; otherwise, they may play any card except for a heart or the Q♠. The other two players follow in turn. These four cards played to the table are called a trick. After all players have played a card, the player who played the highest club collects the trick and places it into a score pile separate from their hand. The 2 is the lowest card of any suit, and the ace is the highest card. 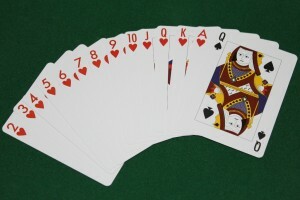 The player that won the first trick then leads any card, except for a heart; again, all players must follow the suit led, if able. There is now no restriction on what may be played if the player cannot follow suit. After all four cards have been played, the player who played the highest card of the suit led collects the cards and gets to start the next trick, and the process repeats. When a player who is unable to follow suit plays a heart, hearts are said to have been broken. Hearts can then be led to subsequent tricks. The thirteen hearts: one point each. In the uncommon event that one player has managed to score all thirteen hearts and the Q♠—an act known as shooting the moon—rather than scoring 26 points, they score zero for the hand, and all three of their opponents score 26! The deal passes to the left, the cards are shuffled, and a new hand is dealt. Game play continues until one player exceeds 100 points; the player with the lowest score at that point is the winner. The Jack of Diamonds variant of Hearts, also known as Omnibus Hearts, adds a fifteenth point card to the game, the J♦. Unlike the other scoring cards, however, the J♦ is not a penalty; it is a bonus, worth −10 points. Like all other scoring cards, however, it cannot be played on the first trick of a hand, and it must be collected in order to successfully shoot the moon. Some groups allow a player to opt to score −26, rather than forcing their opponents to score 26, when shooting the moon. This avoids some unfortunate scenarios where a player shoots the moon, forcing an opponent over 100 and ending the game, but causing the shooter to lose to a player that still has a lower score after the 26 points are accounted for.